Damien Chazelle's bitter-sweet love letter to the city of Los Angeles, the golden era of Hollywood musicals and the visual flair of French maestro Jacques Demy. 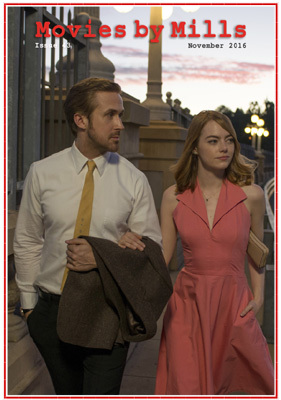 Emma Stone is an aspiring actress barely holding down a day job while juggling auditions, meets a jazz pianist played by Ryan Gosling who is struggling to keep his job at a family restaurant. After a series of blunders and mishaps, romance blooms. Undoubtedly Chazelle has followed Whiplash with another amazing film that has been critically praised and applauded at every screening it has had. A dialogue-free and the first Studio Ghibli co-production, which came about when London-based Oscar winning filmmaker Michael Dudok de Witt was asked by Studio Ghibli if he would make a film for them. It tells of a man who was shipwrecked on a beautiful island devoid of humans and must make the most of what he has to survive. Watched by a group of sand crabs, he attempts to escape, but is thwarted by a red turtle. Shot in gorgeous 16mm, and tells the story of Olli Maki, Finland's hope for the 1962 World Featherweight boxing title. Known as the Baker from Kokkola, Maki's small-town life expands quickly when he's thrust into the media spotlight. At the same time, he falls in love with a local girl. It's an effective sports biopic. The film becomes a charming portrait of an introverted underdog who doesn?t see boxing as the most important thing in the world. Based on a true story. Kenneth Lonergan's third feature as a director; Margaret and You Can Count on Me previously. Casey Affleck gives an indelible, career-defining performance as the laconic Lee, whose spare existence is suddenly ruptured when the death of his brother forces him to return to his hometown he abandoned years before. Now he must face the prospect that Joe has made him legal guardian of his teenage son; neither are happy about that. Adapted from Philippe Dijan's novel Oh' French icon Isabelle Huppert gives a brilliant performance as Michelle LeBlanc, the director of a video game company who is raped in her own home by a masked assailant. Giving no immediate sign of distress and taking what appears to be a deliberate pleasure in shrugging off the terrifying incident, she locks the door after her attacker and gets on with her life. A magical ordinariness in the everyday life of a bus driver named Paterson in a town of the same name. Throughout the day Paterson mulls over words, observing fragments of life and constructing verse for a series of poems he writes in a notebook. Meanwhile, his wife Laura's creative impulses know no bounds and she is learning to play the guitar, bakes cupcakes for a competition she has entered and has a fixation for wearing and painting everything in monochrome. Canadian director Denis Villeneuve's latest film borders science fiction but goes emotionally deeper and heralds a potential award-winning performance from its star Amy Adams who plays Dr Louise Banks who is enlisted by the US government to decipher the language of extra-terrestrials who initiated first contact. Accompanied by scientist Ian Donelly (Jeremy Renner) on a mission to determine the purpose of their mysterious visitation. Saroo Brierley's memoir 'A Long Way Home' receives a sweeping adaptation with this highly-anticipated feature debut from Garth Davis. As a boy Saroo lived with his beloved hard-working mother and siblings in an impoverished rural township in India. One night, when out with older brother, he falls asleep on a train and gets trapped on board when it departs. Days later he arrives hundreds of miles from home and lost. He gets adopted but yearns to find his mother and brother. A delectable comedic drama set in the UK. Catrin (Gemma Arterton) a young Welsh copy-writer enticed to London by her husband, lands a job as a script editor within the Ministry of Information, hired to provide a 'woman's touch' to propaganda films being made during the Blitz. Thrown into the colourful and surprisingly active world of filmmaking in London in the 1940s, her confidence grows and new interests and desires soon ignite. A veritable feast for all cinema-lovers, this is an enthralling montage of magical moments of cinema-going extracted from movie history by Paul Anton Smith. The movies explores the entire film-going experience: underage boys attempting to get in to a cinema to see some bare flesh; pretentious debates in the queues, loading choc-ices into trays, and of course the trailer and the main feature. Susan, (Amy Adams) is a glamourous and accomplished Los Angeles gallery director whose current marriage appears to be unravelling despite the glossy, high design trappings of wealth and success. She fuels her insomnia by reading a manuscript of a novel written and sent to her by her ex-husband. It?s a thriller about a man (Jake Gyllenhaal) whose recklessness and fear ultimately endanger the lives of his wife and teenage daughter. Is she meant to identify with the victim? Two teenagers' lives are changed forever when the first visible comet for a thousand years approaches Japan. Mitsuha lives in a rural area and longs to leave, whilst Taki waits tables in Tokyo when he's not studying. Despite never having met, they both begin to dream about each other, imagining that somehow they have exchanged bodies and are existing in parallel lives. A beautiful romantic animated film. A powerful testament to the defiant and enduring love story of Seretse Kharma, King of Bechuanaland, and Ruth Williams, the London office worker he married in 1948 in the face of fierce opposition from their families and the government of the time. At a London dance, there is an immediate spark of attraction when the erudite and dashing Seretse (David Oyelowo) meets the independent-minded Ruth (Rosamund Pike). Benedict Andrew's remarkable cinematic debut, based on David Harrower's play 'Blackbird'. Una (Rooney Mara) has some deeply unresolved questions about her past and travels to another city and turns up unexpectedly at Ray's (Ben Mendelsohn) work and dredges up a decade-old experience that he thought he'd left behind. The film interrogates the psychology of abuse with intelligence, and restraint.